Various dalit bodies have written to Home Minister Rajnath Singh asking for withdrawal of false cases against dalits registered after the April 2 Bharat Bandh. Vinay Ratan Singh, president of Bhim Army, said, "The government should set up a judicial committee to investigate the atrocities against the dalits. Innocent youth are being picked up and put in jails after the Bharat Bandh." The activists alleged that police was randomly picking up youths since then. The Bhim Army said its activists will court mass arrest on April 18 in Delhi to show their solidarity with those arrested. "It shows how much more can the government be repressive. The protest is against police action on dalits." Addressing a press conference in Delhi on Saturday, Singh said Chandrashekhar Azad of Bhim Army was not safe in jail as he could be harmed. 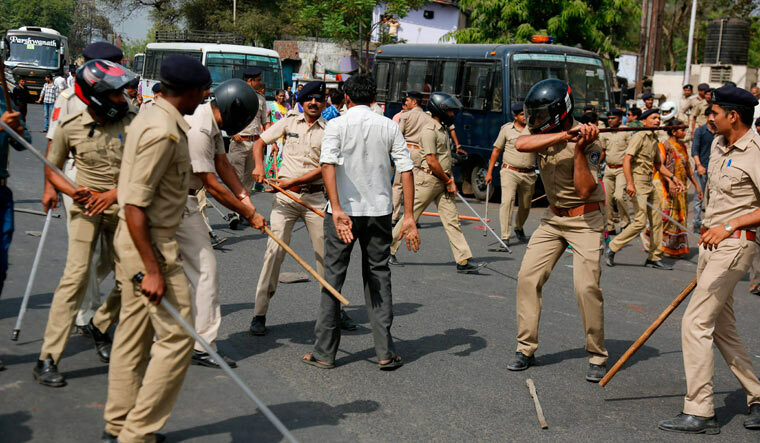 He alleged that when it comes to other protesters, police used water cannons but whenever dalits protested, lathi charge and bullets were used by the police. Singh said they have asked all dalits to gather in Delhi. It will mark the beginning of another movement, he said. "We also demand compensation for the 11 people killed during the April 2 Bharat Bandh," Anil Chamadia, activist, said. He alleged the government and police were lenient on those who were using violence as a weapon against dalits. The activists referred to the case of Raja Chauhan who was caught on camera firing at people during protests. Dalit bodies said as it was revealed the person in question was from the upper caste, it was apparent this was done deliberately to spread violence.